Marc Passey produced another memorable goal in Racers' 6-0 romp. 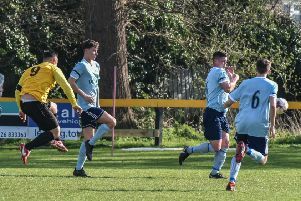 Racing Club Warwick moved up to second in Midland League Division One, with games in hand on leaders Lichfield, after dismantling Nuneaton Griff 6-0 on Tuesday evening. Griff came into the game on the back of a first win for new manager Brett Clarke but the home side got off to a rip-roaring start when Ben Mackey fired home in the fifth minute. Goalkeeper Charlie Bannister, who has turned his loan into a permanent deal, pulled off a fine save to his right minutes later as Griff looked for a way back. However, it was Racing Club who looked the more likely to score again and in the 26th minute, Marc Passey picked up a loose ball and drilled a piledriver into the top corner. Luke Cole continued his rich goalscoring form with the third in the 38th minute to effectively kill off the game. Jak Jeys opened his Racing Club account 16 minutes into the second half, stepping up to send a delightful free-kick over the keeper after Joe Smith had been brought down on the edge of the box. With man-of-the-match Rich Powell driving down the left and putting in quality balls, Racing looked a threat time and again and the returning Adam Knight showed his strength to power through and drill in a fifth in the 80th minute. Three minutes later, skipper Scott Turner turned theball in after Griff had failed to clear their lines. Racers are without a fixture this weekend, returning to action at Townsend Meadow on Saturday October 20 when they entertain Chelmsley Town.